This magnificent Prom Bridesmaid Interwoven handmade necklace features long Necklace 68 inches can wear as 2 or 3 or 4 -strands. 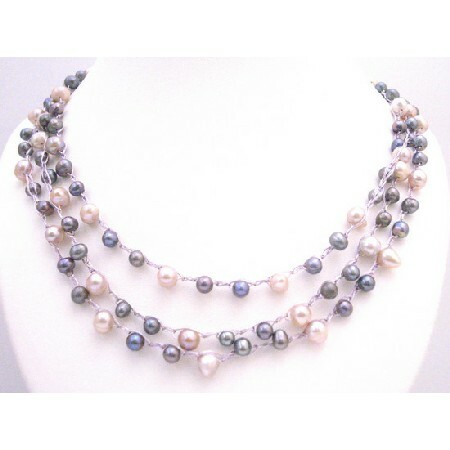 Freshwater pearls Features Cool colors Pink Grey & few Purpler Freshwater Pearls interwoven accented in mauve(lilac) silk string. A cluster of iridescent pearl beads Long Necklace dresses & would look pretty with many of dresses. Celebrate your individuality. Variations in the color & pattern of each beads add the beauty to the necklace.